I'm not sure if it's my recent trip to the beach, my infatuation with nautical stripes or my upcoming weddings that has me loving these shoes, but whatever it is, I do! 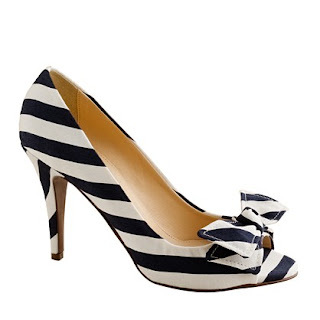 I think these pumps would make the most adorable wedding shoes for anyone getting hitched by the sea. They are the perfect "something blue" and the nautical stripe adds such an unexpected surprise under the wedding gown.